Stacy is joining us again with another fun tween style outfit. You may remember last time she shared her denim Sketchbook Shirt which was layered with a lace overlay sleeved Field Trip Raglan T-shirt. 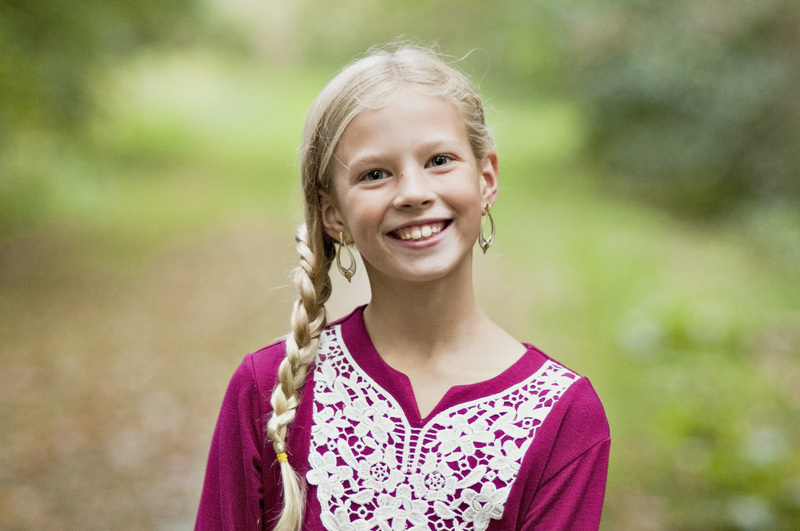 This new ensemble she is showing us today includes a Hide-and-Seek Tunic sewn with knit fabric and features lace appliqué on the yoke. 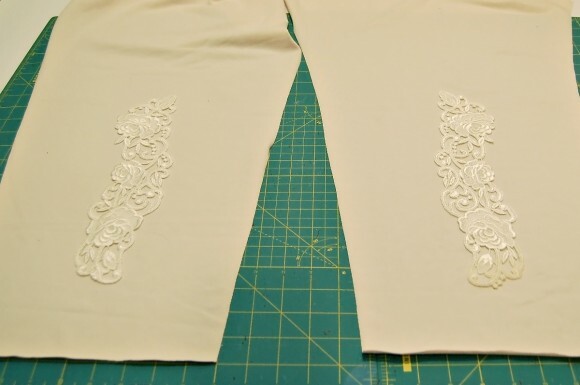 To go along with the tunic she made a pair of Playtime Leggings also with lace appliqué. What wonderful inspiration just in time for our Cinema/Hide-and-Seek Dress sew-along that will be taking place here next week. Thanks for stopping by to share your tutorial Stacy! I love to look on Pinterest to get ideas for tween looks for my daughter. It is such a great compilation of curated looks from around the internet. Sometimes I post items to my board from shops on the internet, or else just copy pins from others. This is a pin that showed up in my feed, and I just loved the romantic look of it. The Oliver + S Hide-and-Seek Tunic pattern was perfect to try to recreate this look. 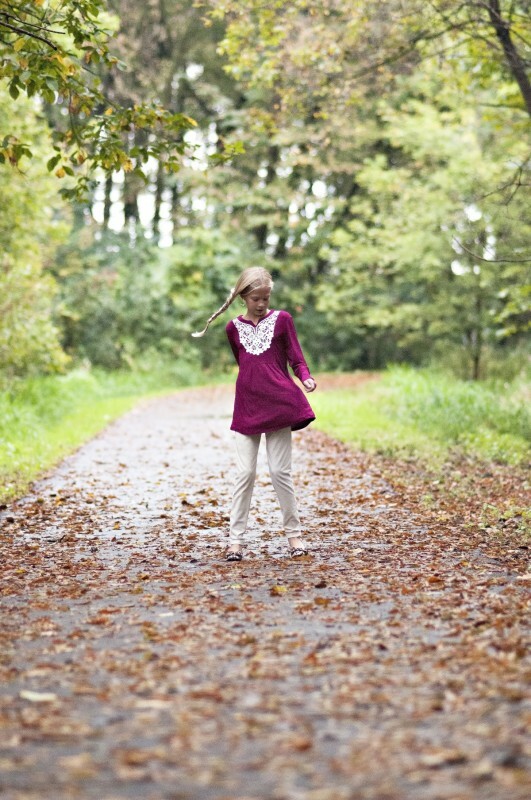 I gave my tween girl some options on colors and fabrics, and she chose a cranberry knit. 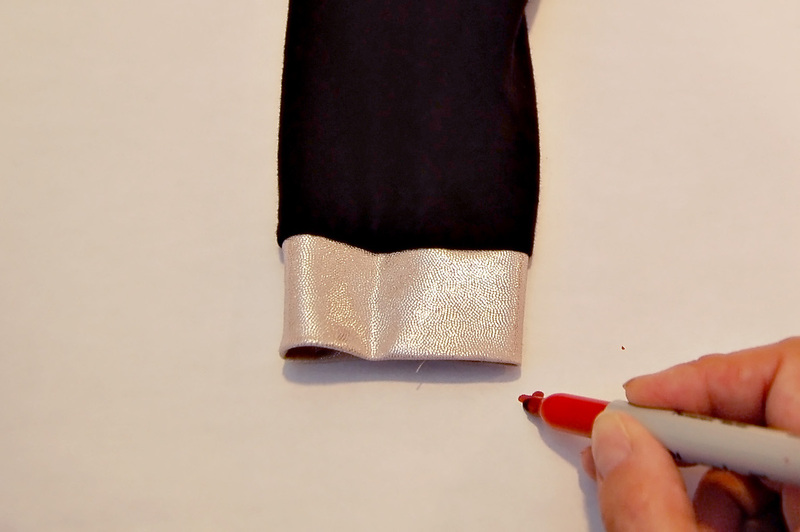 The pattern calls for using a woven fabric, but you can use a knit easily as a substitute. I made a few modifications to this pattern to get the look I wanted. 1. 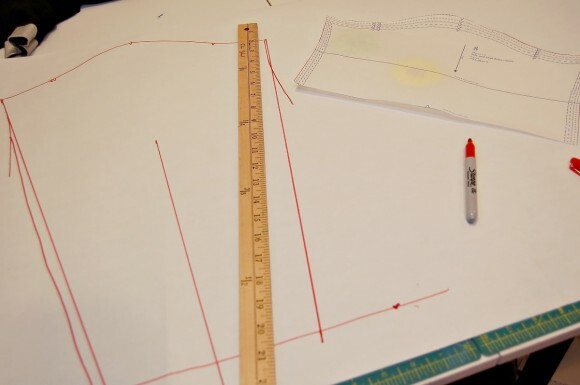 I traced the top of the current pattern onto some white craft paper (with the notch markings traced, too), and drew a line down from the center notch. 2. 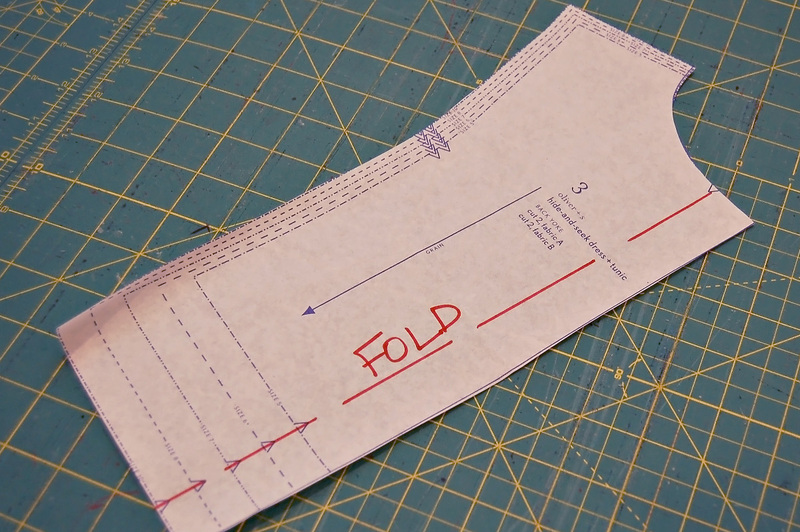 Placed a shirt sleeve that was the correct length against the piece, added a seam allowance and marked that spot. 3. Determined how wide I wanted it to be at the wrist, went out an equal amount from the center, and marked that spot. 4. Connected the line from the underarm to the wrist (it’s not pretty, but you get the idea). 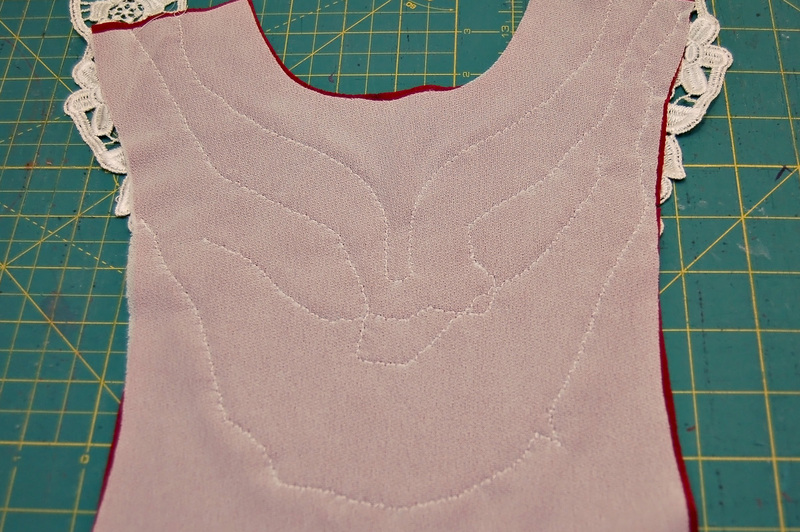 Next, I omitted the back button placket. You use a stretch stitch on your sewing machine or a serger to put this garment together. My girl’s head fit through the opening with no back placket, but this would be something you would have to gauge for your own child. You could also just make the opening a bit wider if you don’t think there is enough room. Lastly, I added the lace to the front yoke, which is backed by Pro-Tricot interfacing. This firms up the knit and allows you to sew on the lace easier. This was especially needed for a light and drapey knit, as I have used here. I interfaced both the front and back yokes to give them some extra body and strength for the seams and weight of the center gathered panel. When sewing on the lace, I make certain to use thread that matches the lace, and I use a narrow zigzag stitch. 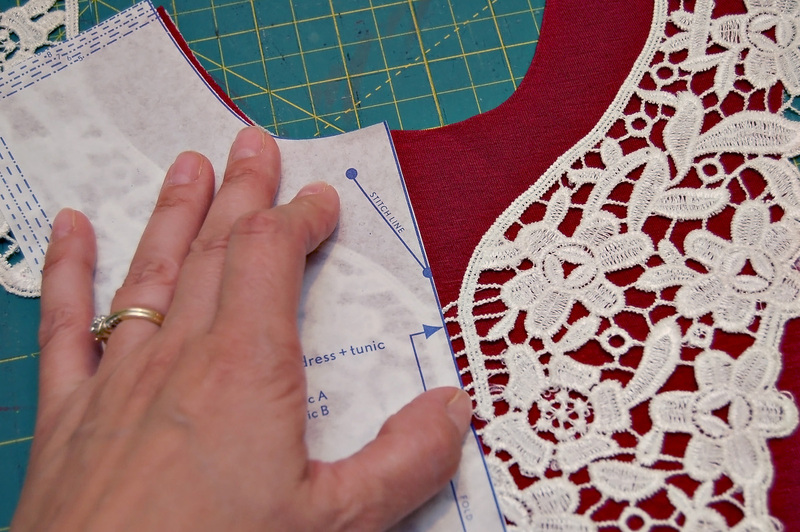 When I placed the lace on the yoke, I made sure that the V-notch at the front yoke’s neckline would be higher than where I placed the lace. 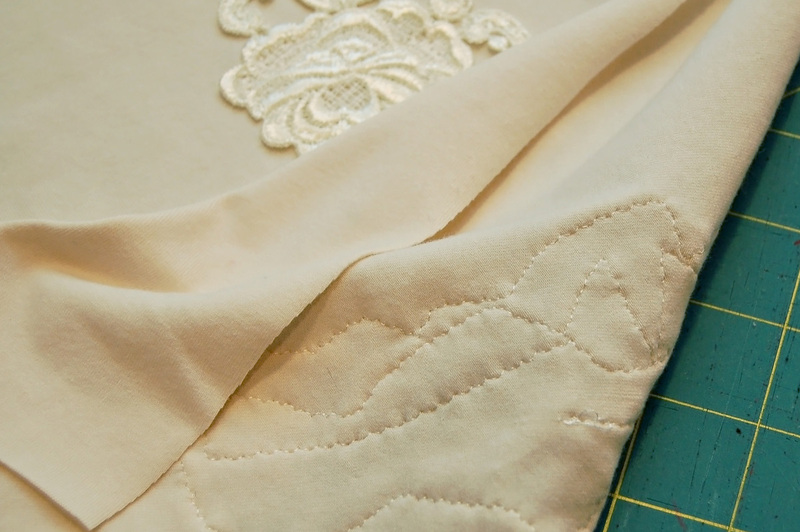 Take your time when stitching on the lace. I try to make sure I catch all the areas that would be loose. 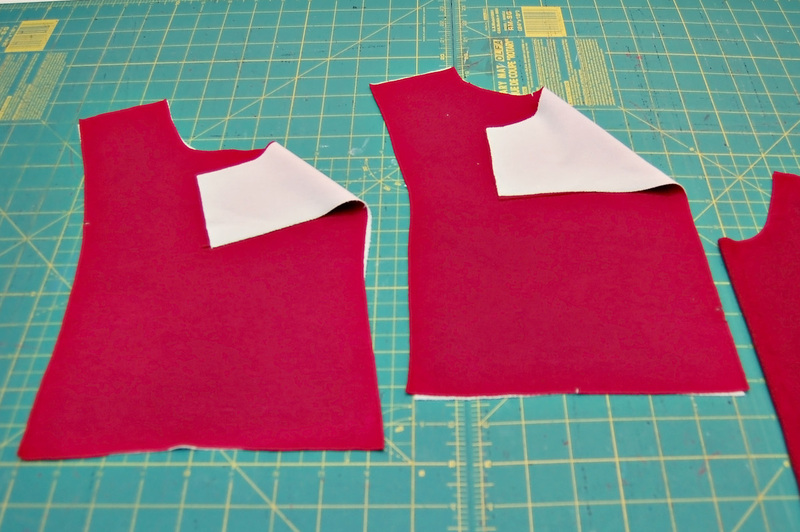 The rest of the garment was constructed per the instructions. The next piece I made for this outfit was a pair of Playtime Leggings out of a cream lycra knit. The knit has a nice body and thickness. I added lace to the side of her calves, and this time did not interface as the knit was heavier. You could also cut out around the lace appliqué, but I kept the fabric underneath. 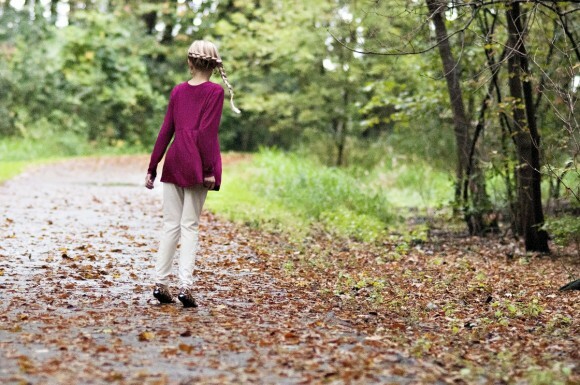 Exposed skin in the wintertime here is not recommended! 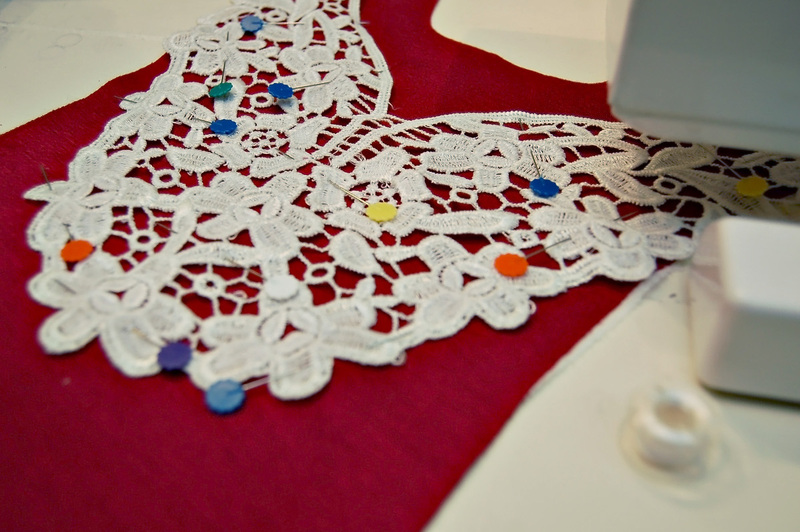 Now to find lace appliqués, you can search on Etsy or Ebay and you will come up with many different suppliers. If you have access to a large fabric store, you may be able to find these locally, as well. I found mine at SR Harris in Minneapolis and they cost $3 each. 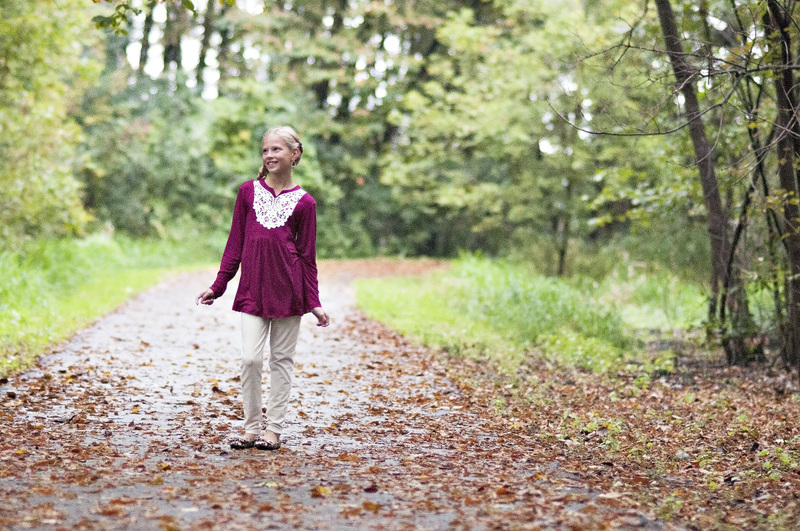 I hope you enjoyed these ideas for turning the Hide-and-Seek Tunic and Playtime Leggings into a tween friendly outfit! Very pretty outfit! 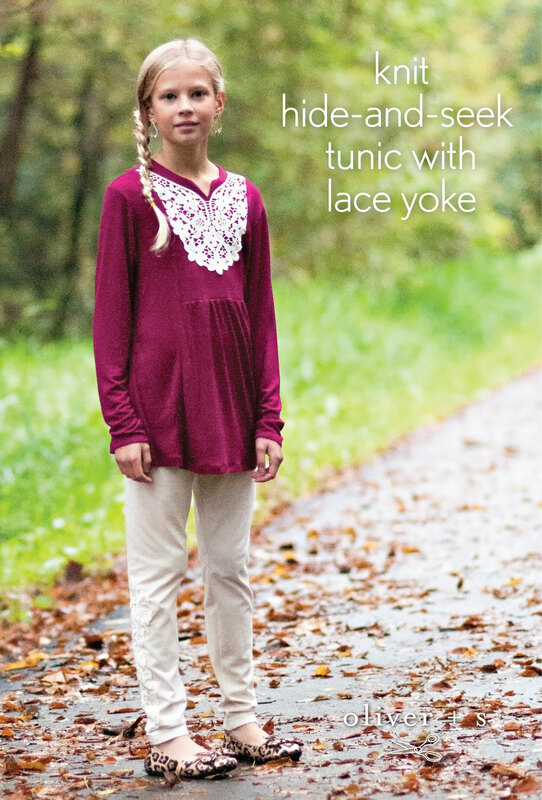 Nice to see the Hide-n-Seek Tunic in a knit. I’ve been planning on recreating a beloved knit Gymboree top for my youngest with the pattern…good to know that knits work well! That lace looks great! I’d wear this one myself.